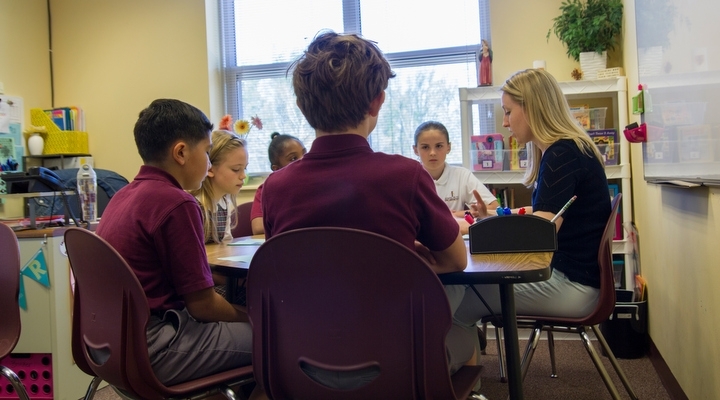 · Small group instructional strategies incorporated in a variety of content areas and grade levels. · A reading specialist who coordinates the use of research-based intervention reading support, either one-on-one or in small groups based on skill levels to support students’ decoding and comprehension. · Special educators who provide supplemental instruction for students with documented learning differences. · Resource team members who work closely with teachers to implement accommodations and develop instructional plans to best support students with learning needs. · Special educators who collaborate with private tutors to facilitate individualized learning. · Resource team members who advocate for students and families when psychoeducational evaluations are necessary. · Resource team members who serve as liaisons between classroom teachers and outside service providers. · Guidance staff and resource team members who provide organizational supports as needed for students. · Guidance services that include small group and individual support for concerns such as social skills, anxiety, study skills, and conflict resolution. · Speech and language therapy services that are provided onsite for students with documented needs through a cooperative arrangement with Anne Arundel County Public Schools. · Occupational therapy services that are available onsite for students with documented needs through a private-pay, third-party arrangement.